There have been some interesting discussions about maps recently, whether we are talking about Google’s displacement in iOS, or Apples inauspicious start, or maybe even Nokia’s (see NAVTEQ) continued ascendancy with social location services. With all these mapping technologies and services vying for our attention clearly the services that boast the greatest coverage and accuracy have greater claim to be the popular choice. 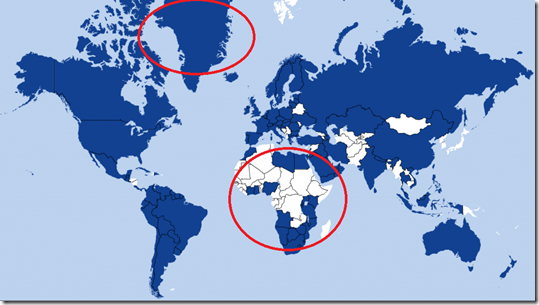 A recent blog post by Nokia, however, made me consider and question whether the maps used for relative comparison are even worth the html page they are embedded upon. 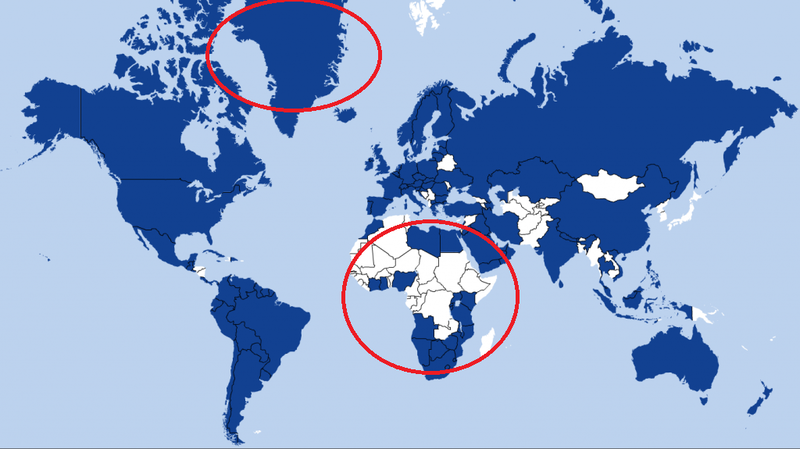 Lets take the following example where Nokia clearly had an advantage over other maps, however, the biggest difference appeared to be the 100% coverage found in Greenland. So what is the problem with the map? Well Greenland appears to be about to be the size of Africa, when in truth Greenland is about 0.8 million square miles, where as the continent of Africa is approximately 11.7 million square miles (that is more than 10 times larger). Now I am not a cartographer (obviously) but this particular map projection (Mercator) puts Greenland’s terra firma at a sizeable premium. This is due to the the fact that the scale increases the further the object is from the equator. While I am not crying conspiracy here, it is self evident this this map was more convenient, and practical in eras dominated by euro centric empires. In reality we have had a reasonable (and albeit controversial) alternative to this projection for over a 100 years, but even today it has gained relatively little acceptance. At this point I am just wondering if we can reset the discussion and start with a map that reflects our globe before we complain aggressively about the precise location of the Washington Monument?